They are firefighters and schoolteachers, farmers and carpenters, plumbers and bank tellers and artists. They are our neighbors and friends, our grandparents and grandchildren. They are us. And many of them can’t afford to live here, where they work every day, where they grew up. I work with a lot of families and with the average rate of pay, many can’t even afford an apartment. They have to share and combine households just to be able to have a place to live – which is typically too small a home for this. Sometimes you’ll see seven to eight members of a family living in a 2-bedroom apartment. It’s also due to the fact that there aren’t larger rentals available or affordable. In moving back to this area about five or six years ago, I didn’t think it would be so hard to find an affordable place to live in South Placer County. My daughter, who lives in Roseville, gave me a hand visiting a lot of locations and I filled out so many applications to no result. At 71, I am on a limited income and could not afford most anything that was available, and there was very little available to begin with in this area. Ninety-one year old Aghavni Davis is like many seniors living in Placer County. She lives alone, has no close family or friends in the area, and survives on Social Security, SSI and federal housing credits. Now, losing her hearing and legally blind due to macular degeneration, she requires the daily help of a caregiver to manage her daily routine. Mike has a master’s degree and works at a financial institution in Roseville. Jessica holds 4 certificates and works as a caregiver in Loomis. Mike and Jessica are young professionals and, as much as they’d like to live in Placer County, they live in Sacramento where it’s more affordable for them at this time. They continue to pursue looking for a home here but, with a less than 2% vacancy rate for rental housing and the median home sale price in Placer County of over $425K, it’s been difficult. Joan has lived in the same apartment for over eight years in Auburn. She reported that her rent has increased multiple times over the years and each time she was given only 30 days’ notice of the increase. Today, her rent stands at $1035 a month, an increase of 25.5 percent, leaving her with a mere $15 to spend. In total, 98.5 percent of Joan’s fixed income now goes to rent. Art, a single father, raised his son in affordable housing in Roseville. Although Art’s son has moved out and is now a father himself, he is still very happy living there after more than eighteen years. Catherine, a single hard-working mother has lived in affordable housing for over 10 years. Her three children have all graduated from Granite Bay High School and continue to live at home while they work and attend Sierra College. Balerin thanks Project Go for having affordable housing in our community that has allowed her family to live in a nice, safe, quiet place that they are proud to call home. Ed is a youth pastor at a church in Rocklin and has lived in an affordable housing development raising his three children as a single father. Two of his children still stay with Ed while they attend Sierra College. Monica has raised her two sons, Alex and Noah, for the last thirteen years in an affordable housing development. Alex graduated high school and received a full-ride scholarship to a university in Kentucky, while her youngest, Noah, will graduate high school this year. Send a call to action to our policy makers to prioritize housing needs in Placer County. Take a moment now to read and sign this petition. 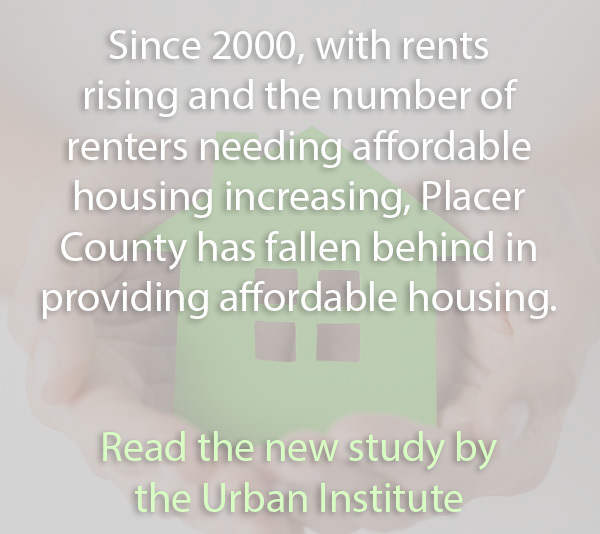 Nearly 42% of Placer County households are strapped by housing costs. Whether renting or buying, families are getting priced out of our communities. It’s our firefighters, schoolteachers, bank tellers and trade workers. They are us, our neighbors and vital to the stability of our workforce and economy. We are facing a serious gap in housing. According to the Sacramento Area Council of Governments (SACOG), Placer County needs 21,000+ new units of attainable housing by 2021. But as of the most recent County Housing Needs Assessment Progress Report, less than 4% of these units have been built. Sign this petition to send a call to action to our policy makers to prioritize housing needs in Placer County. And use your digital blow horn to encourage your social media and email network to sign it as well. Your support matters! Title Ms Mr Mrs Miss Mx. Dr.